KUALA LUMPUR (Sept 26): The FBM KLCI fell 2.61 points or 0.14% to settle at 1,840.50 points today, resulting in a week-on-week decline of 8.99 points or 0.49% from the previous week’s closing of 1,849.49 points. With 2.49 billion shares traded at a total value of RM1.98 billion, an analyst with an investment bank said market activities are “still within the normal trading range”, although support appears to be waning. “There hasn’t been much good news to boost the market, which has been trading sideways for a few days now,” he said, citing the strengthening of the US dollar that signals the reversal of fund back to the US. He added that in the middle to long term however, the outlook for the KLCI would still be “positive”, given the country’s still healthy fundamentals and its relatively stable policy, as well as economic environment. “With the start of QE (quantity easing) in Europe and the ongoing QE in Japan, I believe the local market will still enjoy some spillover from the excess funds in these regions,” he explained. He also said that “it is just a matter of time” before the KLCI catches up with its regional peers. “It is just going to be a matter of time before foreigners start accumulating again in Malaysia. Our stocks are still fairly valued and I do not think that they are expensive,” he said. 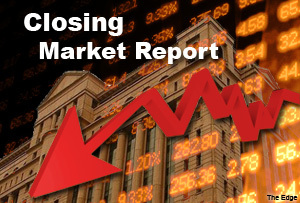 At the close of trading, Bursa saw 322 gainers, 475 decliners and 327 counters unchanged. Berjaya Corp Bhd is the most actively traded stocks, with approximately 199 million shares traded. The counter also gained 5.5 sen or 10.7% to close at 57 sen.
Top gainers today were British American Tobacco (M) Bhd, Tecnic Group Bhd and United Plantations Bhd. Meanwhile, Press Metal Bhd, Hong Leong Financial Group Bhd and Hong Leong Industries Bhd were the top decliners. Regional stock markets also ended the week with losses, with Japan’s Nikkei losing 0.88%, Hong Kong’s Hang Seng shedding 0.5% and South Korea’s Kospi declining 0.12%.